After a tumultuous pregnancy that included a diagnosis of placenta previa and being bedridden for several weeks, our son Adam has made his entry into this world. Having reached the 36 weeks and 2 day mark, we hoped that everything would go well, but unfortunately that’s not what happened. Adam needed to be resuscitated twice at Anna Laberge Hospital and couldn’t breathe on his own. Doctors quickly decided to transfer him to the Montreal Children's Hospital. They feared that Adam was lacking oxygen and hoped he might be eligible for a new procedure called Total Body Cooling. Our little munchkin had to be transferred alone, without his mom, to the Neonatal Intensive Care Unit (NICU) at the Children's, be sedated and put on a cooling mat for 72 hours in order to minimize the effects of possible brain injury from his lack of oxygen at birth. It's not easy for a mother to see her baby leave via ambulance without really knowing what would happen. Fortunately, Dad was able to follow the ambulance, and they took care of him practically just as well as they took care of Adam. 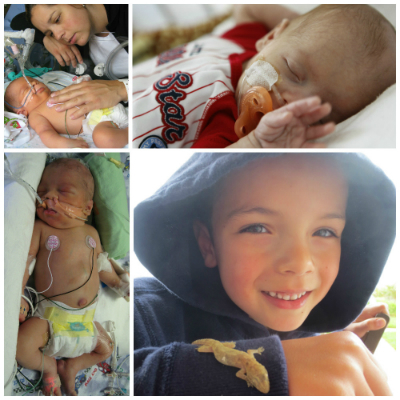 The NICU staff and the staff on the 6th floor where Adam spent the following three months was really incredible. Today, Adam is a 6-year old boy who’s in perfect health. He’s now in first grade and learning to read and write at the same rate as the other children in his class. He plays hockey in the winter and baseball in the summer -- even though we were told that he would probably experience shortness of breath due to the 6 months he was placed on oxygen to help his breathing. He’s full of energy and quite the character! He exasperates his older brother on a regular basis but we are so grateful to have him in our lives. He is a curious, insightful and friendly little boy who is helpful and listens to the needs of others. We love him so much! The team at Children's, led by Dr. Riley, his doctor, is in large part responsible for the survival of our son and we are so grateful! Many thanks to you all.